RESPA®-CF Vortex HyperFLOW Fresh Air system with Electronic Pressure Monitor and RESPA®-CFX Recirculated Air system were installed. Results after 1,120 hours: no HVAC breakdowns or clean outs, air quality dramatically improved. The operator was very happy with the improved air quality in the cab. 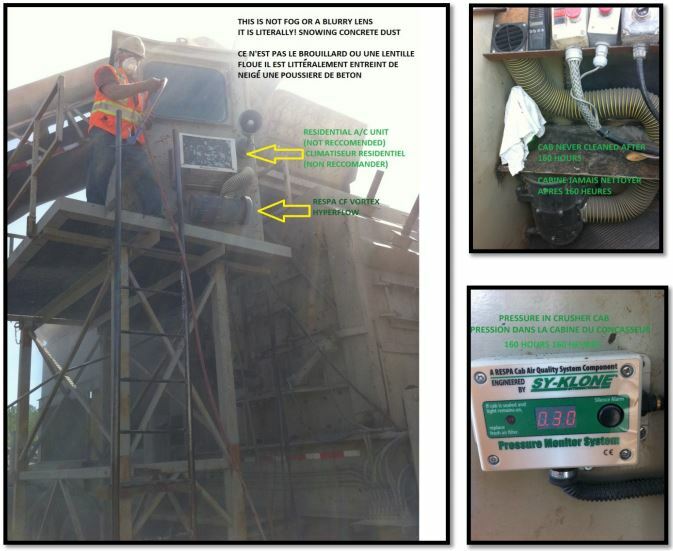 High Respirable dust concentrations in crusher cabin require the HVAC evaporator core to be cleaned weekly. Often the air quality in the cabin is highly contaminated with rock dust, reducing operator comfort as well as the life of the machine.